Blichmann Engineering's industrial-grade brewing gloves are standard-issue in commercial breweries. Our research and development team has used them for years and wouldn't brew without them. We recommend the same for the serious homebrewer. 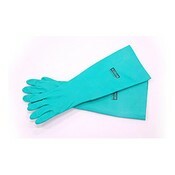 ·Gloves reduce your risk of burns and scalds. ·Harmful sanitizers, acids, and caustic chemicals are kept away from your skin. 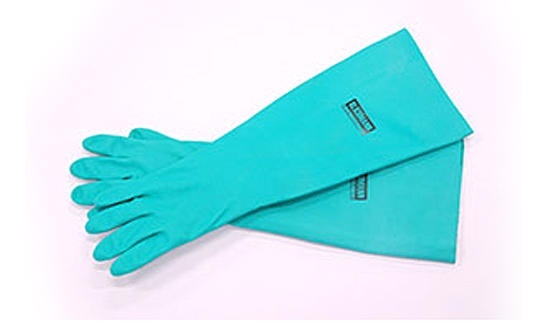 ·Because gloves can themselves be effectively sanitized, they help you maintain sanitized equipment. ·Elbow-length size allows you to reach into 5 gallon pails. ·The tear- and puncture-resistant nitrile rubber is 28 mil thick — up to four times that of household gloves — while maintaining great feel and dexterity. SIZING GUIDE Gloves are available in Medium (size 9), Large (size 10), and Extra Large (size 11). To select your size, measure the circumference of your hand in inches at the knuckles using a flexible fabric tape or a piece of string. That measurement corresponds with the glove number size. For half sizes, round up to the next size. For example: ·If your hand measures 8.5", select size 10. · If your hand measures 8.25", select size 9.